Rockstar has released details on its upcoming update for Red Dead Online. Scheduled to release on February 26, the update brings with it a host of improvements and enhancements to the online component to the massively popular Red Dead Redemption 2. Among the changes are a new law and bounty system, weapons balancing and player blips on the map. To "minimize certain types of destructive player behaviour", Rockstar is changing the way player blips appear on the map. Visibility of players over long distances will be reduced, with your blip only being displayed to others within 150 metres. This should help players who have found themselves on the wrong end of a griefer who hunts them across all corners of the map. In the update, overly aggressive players will become more and more visible to other players with a progressively darker blip, that incrementally shifts from blue to dark red. Visibility will increase through bad deeds like attacking other players or killing their horses (you monster). Players can mend their ways and will change back over time, provided they can withstand the allure of playing the bad man. It wouldn't be the wild west without laws to break, so players who have racked up high bounties may find themselves on the wrong end of a NPX Bounty Hunter, with grand plans at eliminating you for a reward. All criminal behaviour will have honour and bounty consequences that scale based on the heinousness of your deeds. Killing other players will likely incur a higher bounty than assaulting townsfolk or animals, provided they live long enough to report the crime. Low-level crimes like looting will only affect your honour. 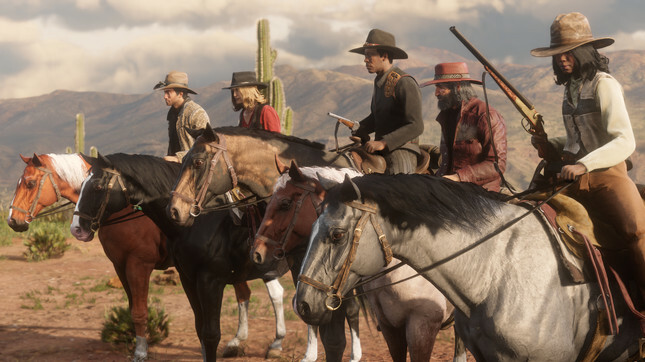 Rockstar is adding a variety of Daily Challenges which will task players with individual objectives covering every aspect of life in the west. Challenges will range from gathering select herbs to taking down animals and clearing hideouts. Rockstar plans on evolving these activities over time with plans of "bringing specialty challenges and rewards, streak bonuses and more." Based on player feedback, certain weapons are being re-balanced, including the Varmint Rifle, which will see its accuracy tuned to be more in line with other longarm weapons. Those fed up with hearing terrible cowboy impressions will also be pleased to hear that voice chat proximity is being reduced. For a full breakdown of all the changes coming, check out the Rockstar Blog.